from only 28 Euro / Month ! Coverage also in EU ? Health insurance is mandatory for every resident in Germany. However, if you are a foreign national, choosing the right health insurance plan can be a bit tricky. There are too many options and one needs to identify what works best for him or her. Speaking of foreigners in Germany, they can be categorized into many different types. Before delving into the rules applicable in individual cases, we have to look at the basic question first. Who is eligible for a public health insurance scheme in Germany and who comes under the private health insurance plan coverage? 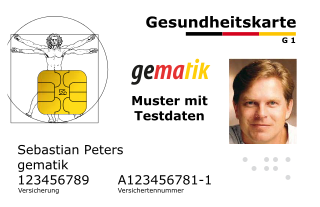 Even though a good majority of the German population (about 85%) is covered under the state health insurance plan (Gesetzliche Krankenversicherung, Krankenkasse or GKV), some categories of foreigners cannot become a part of it and need a private health insurance. All residents of Germany including all foreigners are required by German law to have health insurance. And additionally without it the cost of medical care can be unbearably expensive. Let's look now into different scenarios applicable to various kinds of foreign nationals in terms of health insurance. It is known that the public health insurance in Germany is a lot cheaper than the private counterpart. The public insurance system is managed by 118 non-profit associations (Krankenkassen) with the help from the German government. A few of the popular names are TK (Techniker Krankenkasse), AOK, BEK, DAK, GEK, BKK and KKH. In the case of working people, contributions to health insurance are split roughly equally between employers and employees. If you are employed in Germany and you are earning less than the threshold amount (currently in 2017: 57.600 €) then you are automatically insured in a public health insurance scheme. Registered unemployed people from selected foreign countries. Private health insurance in Germany is opted by a lesser percentage of people in the country. Even though it is costlier than the state scheme it also has its’ own share of perks. Having a private insurance usually leads to the lesser waiting period in getting appointments with medical professionals. It may seem unfair, but some doctors restrict their services only for private patients. They are also offered extensive medical tests (obviously because they can be charged a bigger sum). Popular private insurance companies in Germany include Allianz Private Krankenversicherung, AXA, DVK, Debeka, Deutsche Krankenversicherung, Signal Idunaa, HUK-Coburg-Krankenversicherung, Bayerische Beamtenkrankenkasse, Continentale Krankenversicherung, Central Krankenversicherung, Barmenia and so on. Self-Employed and Freelancers in Germany can select between private and public health insurance companies. It depends on your age and current health condition, but often the private health insurance company will offer you the more affordable prices. If you fall under neither of the categories above then you are probably a tourist or just in Germany for a business trip or something. In that case, you have to apply for a travel insurance before coming to Germany. Travel insurance can be bought from any insurance company in your own country or even better in Germany, but make sure it satisfies your needs and the visa requirements (see below). If you need a visa for Germany, you need to purchase a travel insurance plan that meets all the requirements by the German embassy before appearing for your visa interview at the German consulate. Even foreign students and employees who come to the country for a longer stay need travel health insurance first (see requirements below), and later become a part of the German health insurance system (either public or private health insurance plans). If you need a visa for Germany or need to extend your visa please be aware that your travel health insurance for Germany should meet the following requirements or you risk a visa reject. What are the minimum requirements for the travel health insurance for Germany? For the visa process the German embassies, consulates and the aliens office (Ausländerbehörde) in Germany need evidence of valid health insurance. It is critical that the amount of insurance coverage is minimum 30 000 euro and this fact should be stated on the insurance policy. Often the problem with foreign insurance policies is that this requirement is not met. Our recommendation goes to the health insurance of Hanse-Merkur Versicherungsgruppe. 1. They provide good and cheap health insurance for all foreigners already from 30 Euro/ 30 days with a maximum insurance period of 2 years. 2. The insurance meets the current requirements for a Schengen-Visa and can be used for Visa Application or Extension at the embassy and in the aliens department (Ausländerbehörde). The required minimum coverage of 30,000 Euro is ensured and is stated on the insurance policy. A few minutes after your Online Registration you will receive by email your insurance documents as PDF Files. These documents are needed for your doctor's appointment, but also for the presentation at embassies, consulates and foreign authorities.